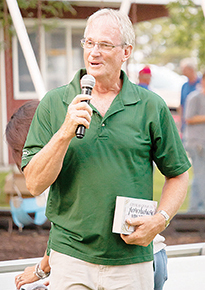 John Veik, manager of Helena Agri-Enterprises facilities at both Petersburg and Albion, was honored by the company for his many years of service during their annual appreciation supper on Friday evening, Aug. 17, in the Petersburg Park. John started his association with the company in 1976, when he worked summers during college for Ag Supply Center when it was owned by Marv Koch. He started full time with Ag Supply after completing college in 1979. 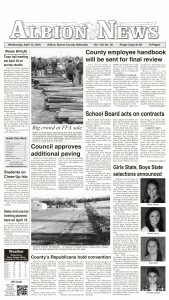 Helena Chemical Co. purchased Ag Supply on Nov. 1, 1994, and John became manager of the Petersburg branch in 1995. Helena purchased the Albion locaiton in 2000, and John became manager of the Albion branch, in addition to Petersburg, a few months later. John said he plans to help a new manager transition into the position, and will retire Jan. 1, 2019.